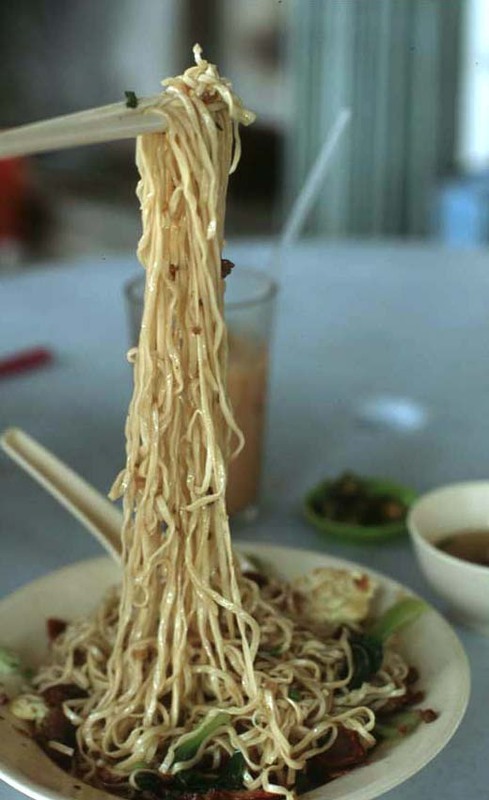 A couple of Saturdays ago I opened my email inbox to find a message from an EatingAsia reader, advising me of a "Chinese kopitiam selling delicious Sarawak's famous kolo mee" near the Malaysia Institute of Baking (MIB) in Petaling Jaya (PJ) new town. Three hours later I was wandering the area with Dave, scribbled note in hand, pestering young and old alike for directions to a nonexistent coffee shop. My source had gotten the name of the kopitiam wrong, but no matter. We found it soon enough and, though he may have incorrectly named the venue, our reader was absolutely spot-on as regards the deliciousness of said kolo mee. 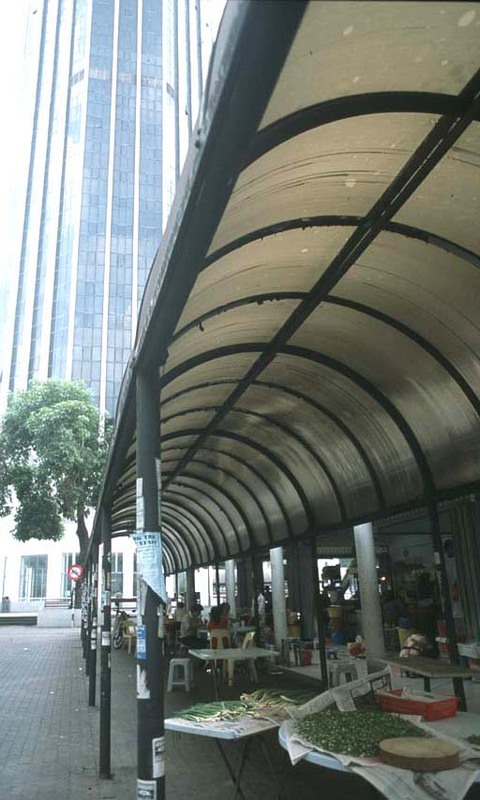 Restoran Fook Yun wraps around one corner of the intersection of two pedestrian-only lanes. The ladies selling kolo mee from a stall topped with a yellow and red sign touting "handmade noodles" have been in business for only a little over a year. 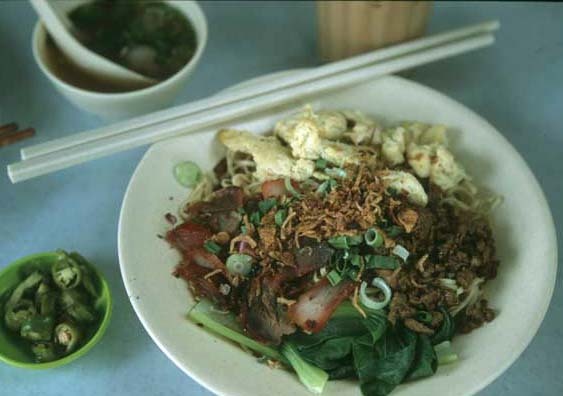 For the uninitiated, kolo mee is a simple dish of noodles topped with barbecued pork, a few stems of one Chinese green or another, and a sprinkling of spring onions, served with a bowl of meat soup. Fook Yun's kolo mee ladies ratchet the dish up a notch, adding scrumptiously seasoned pork mince, scrambled egg pieces, and lots of fried shallots to the mix. Toppings are so generous that they literally blanket the noodles. 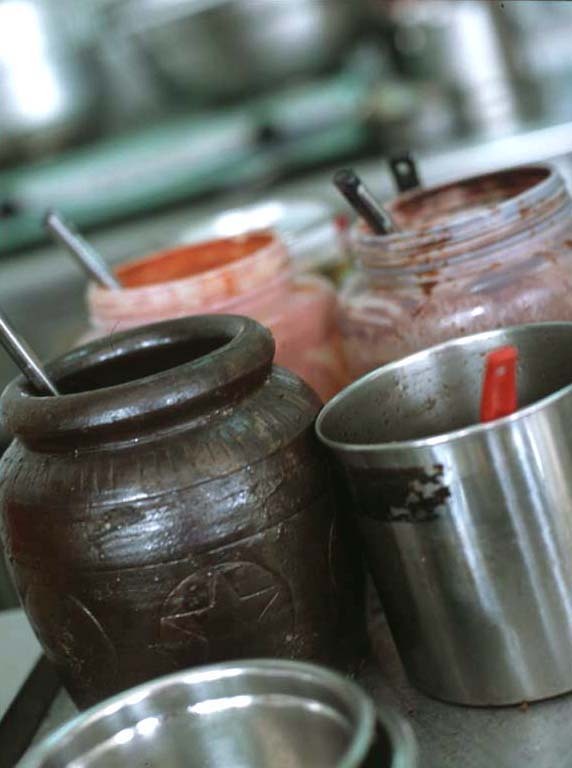 Bobbing in the broth served alongside are two tender, meaty orbs studded with tasty bits of green onion and red capsicum. All well and good and delectable, but for me the real gastronomic excitement of this dish is in what lies beneath. The vendors tell me that they rise extra early everyday to whip up a fresh batch of these semi-wide egg noodles, and I believe them. I'm a bit of a noodlehead, especially when it comes to thicker, more substantial versions like these. Silky and supple, with a pure eggy flavor, and cooked agreeably al dente -- these scrumptious strands of pasta could easily stand up to some of the best fresh pasta I've sampled in Italy. So much so, in fact, that I briefly pondered purchasing a kilo to take home and sauce up with a nice chicken liver-y ragu Bolognese for dinner that evening (I may yet pursue this fantasy). 'Nuff said. These nectareous noodles had me humming a happy tune the rest of the afternoon. Thanks mucho, TH! Oh I'm sorry -- did you think we were finished? After just one bowl of kolo mee between the two of us our stomachs were still growling; this Ipoh chee cheong fun a few steps away whispered our names. Chee cheong fun often make an appearance at dim sum; they're big, wide rice noodles rolled around a variety of fillings (minced pork, or shrimp, or scallops, or...) into a sort of log, and doused with a sweetish soy sauce. Ipoh-ites do theirs a bit differently, chopping an unfilled noodle log into chunks and liberally lashing them with chili sauce, sweet-salty "brown" sauce, and sprinkles of sesame seeds and fried shallots. As the sign says, fish balls are an optional add-on. Are these chee cheong fun really handmade? I couldn't tell you, but I can say that their texture was simply sublime. Thinner and lighter than the usual dim sum variety, they were so soft as to be almost pillowy. Just another noodle-related reason for a repeat nosh at Restoran Fook Yun. On the way back to the car we stopped in at MIB's ground-floor bakery. Chocolate fudge layer cake: flavorsome frosting, disappointingly dry cake. More than redeemed by the springy orange muesli bread (no added sugar) which, though a bit skimpy in nuts, is blessed with the glorious fragrance and flavor of orange peel. Yummy toasted and eaten with honey. Sarawak kolo mee and Ipoh chee cheong fun at Restoran Fook Yun, PJ new town. No address, but -- stand with your back to the MIB (11 Jalan 52/8, Merdeka Square). Fook Yun is just a minute's walk forward and to the left. Update: Friend, EatingAsia reader, and vigilent copywriter SW has set me straight as regards what Ipoh chee cheong fun is, and is not. 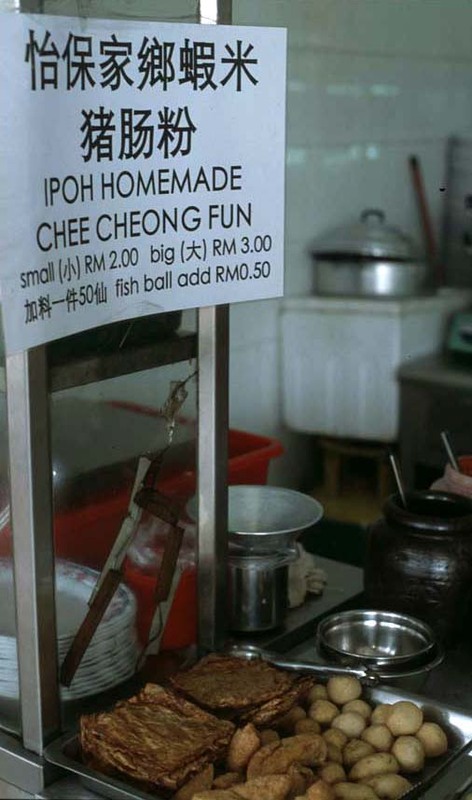 Question is, what gives with the "Ipoh" on the sign of this not-Ipoh chee cheong fun vendor? 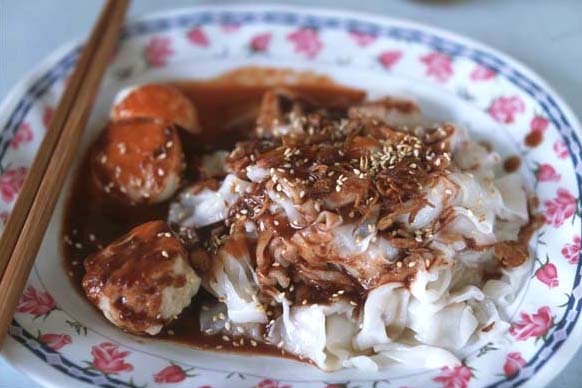 Ipoh-style chee cheong fun is usually served with minced pork and mushrooms. The chee cheong fun in the pic is the standard chee cheong fun - some stalls just sell it in plain flat sheets, others in rolls and some offer you a choice of both. The sauces drizzled over are "teem cheong" (Cantonese - sweet sauce) and chilli sauce. 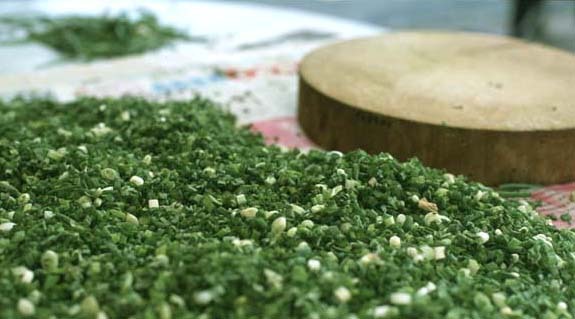 There's also a dash of oil, sesame seeds and sometimes soya sauce. Some stalls also offer you the option of "karlay chup" (Cantonese pronunciation of curry gravy). There are also variations of "teem cheong" - it ranges from a reddish almost maroon coloured sauce to various shades of brown. Can't wait to c ur new post. Take care. I feel ashamed for the fact that I have been working in PJ (near Old Town) for almost 8 years but never been to the Sarawak Kolo Mee at Fook Yun, PJ State. That meal just looks wonderful! BT, thanks for the tip. It goes in my "must-try" notebook! Barbara, not to toot Dave's horn but I have to say that when I look at that picture of the egg noodle scoop-up, I feel very hungry indeed! i love sarawak kolo mee, my housemate bought it back straight from sarawak once and we reheat and had a feast. anwyway, the ones from sarawak are oni reddish in colour and no dark soy sauce added. as i know, it is just flavoured with the sauce from the "char siew", bbq pork. nervertheless, this one looks yummy too! Looks like kumloo Hakka mee to me! Went to Fook Yoon last Sunday looking for the Ipoh CCF..couldnt find it. Found the KMee instead. Pls advise exact location - there was a CCF vendor outside but he came in a van..dont know how good but the Q was long! ET - ok, as near as I remember (haven't been back since the post - you know, so many stalls to try, so little time). If you are standing facing the kolo mee vendor, with that tall building to your back, the CCJ will be to your left a couple of vendors up. They are right on the street, perhaps next to the wall. Perhaps they were closed the day you passed by? Look for the sign. Thks for info..yes the stall was closed last Sunday..just my luck! Any comments on the Tex mex food standard here? ET - oooh, a couple nasty encounters with Tex-Mex in Asian cities has taught me to stay far, far away. When it's anything-Mex I'm craving I head to my pantry packed with the dried chilies, hominy, and masa I've humped back from the US and devote a couple hours to the kitchen. So it's up to you to be the guineau pig! If you find anything noteworthy do me a favor and drop me a line. Oh Dear..dare I ask whether the standard fare by Chillies Restaurant chain in Bangsar SC /KLCC is any good? The magarita seems decent..
but by any standard..home cooked benchmarked to mom's cooking is best!